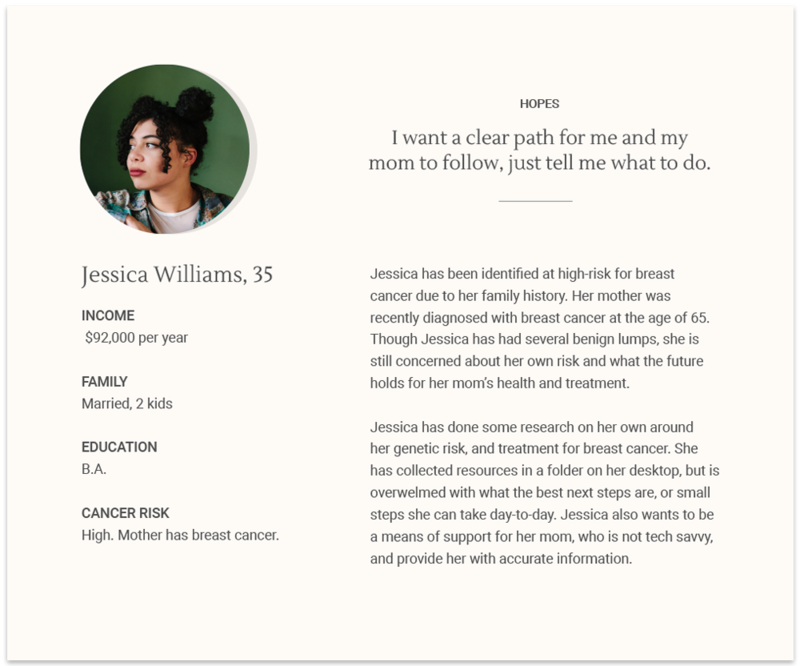 Proto-personas are a quick and inexpensive way to model customer needs, goals, and challenges for your digital product or web project, and help orient the team towards more empathetic thinking. Proto-personas can be created relatively quickly. Above is an example. We use a basic template we created and modify the information based on the needs of the project. You've probably heard of traditional personas, but what exactly is a proto-persona? Proto-personas are a modified version of personas that stimulate the same type of empathetic and user-oriented thinking, but with less investment in time. They can be created with the help of the cross-functional team, which makes them a quick and inclusive tool for turning on the user experience goggles. In essence, proto-personas are a persona hack that you create using whatever data you have available and with the help of the team. How are these different from traditional personas? Whereas a classic persona builds on firsthand user research, a proto-persona is based on whatever insights you have, which can include secondhand study or even the well-informed hunches of a team of people. (Of course, if you have firsthand research to refer to, that’s ideal.) Proto-personas are less scientific and rigorous than traditional personas, but they can be equally useful for helping a team shift into a more empathetic mindset about users' needs. You have an unclear picture of your target users. You find that you and the team talk about users and their motivations in generic and non-specific terms. You sense that the team needs a more empathetic and human-centered way of thinking about users. Invite members of the project team that have direct access to customers. For example, people who often hear or experience customer pain-points, because they’ll have great first-hand customer insights. The meeting should take no longer than an hour. Explain to the team the purpose of the activity, that the intention is to get people thinking from the perspective of the users, and how they use the product or service. Organize the team into groups of three, and prompt people to discuss what the customer’s 1)needs and 2) goals are with the product or service. Collect answers on sticky notes if this is an in-person session, and google doc if it’s remote. Give each team a poster-sized persona template and ask them to fill in the data for each box. Ask them to create a scenario for the persona, including where they live, occupation, a “day in the life,” pain points, and what happens before, during, and after using the product or service. Allow for 30-45 min for this step. After each of the teams has filled in the information on their poster, have each team share their proto-persona. Add any gaps or details that are suggested by the audience if necessary. Determine how you would like to use the proto-personas, or if there will be additional research required to follow up on the Proto-Personas, to fill in gaps. We recommend creating a proto-persona template in Sketch, which you can customize to align with your company's or client's branding. Although the poster-sized model is great for in-person sessions, a formalized document to capture the team’s Proto-Personas is helpful for documentation purposes. In summary, proto-personas are great tools that can be quickly created to get everyone on the same page and to help the team empathize with your users.